Do We Ever Become Adults? Divorce has restricted access to your children/ Because you see them so rarely, you overindulge them with play, treats, excursions. Treating them to good times help assuage your pain, jealousy, and anger, but you too easily forget your fathering includes counsel, skill sharing, and supportive discipline. The manhood game cards were created and developed by Dr. George Simons as a way to reframe men’s perceptions of themselves. Life is often played as game in which men’s welfare is a pawn to be sacrificed. Today I invite you to join me in another game, diversophy Manhood, a game for reframing men’s perceptions of themselves, for refreshing their mission in life, and disarming social biases that attack male health and limit the possible in their own eyes and actions. Each day I will post a new card from this game, a snippet of wisdom to GUIDE our exploration, a RISK to face, facts to test our SMARTS, a CHOICE to make, or an experience to SHARE. This post was originally published on George Simons LinkedIn and is republished here with his permission. 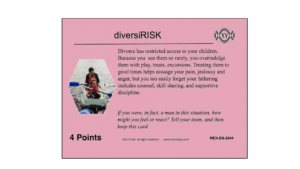 See all published Manhood Game cards here. Several new cards are published every week! Want a place to discuss the issues of masculinity in a forum with other people? Join our Masculinity Detox Facebook Group here. We are always looking for people to write about the changing roles of men in the 21st century. The Manhood Game Cards make great writing prompts. What is your view on how men’s roles are changing? Can you write a post (300-750 words) that tells us your own unique point of view? If so, please join our writer’s community and click here to submit via our submissions portal. The Good Men Project has pioneered the largest worldwide conversation about the changing roles of men in the 21st century. Your support of our work is inspiring and invaluable. A $50 annual membership gives you an all-access pass. You can be a part of every call, group, class, and all our online communities. A $25 annual membership gives you access to one class, one Social Interest group and our online communities. A $12 annual membership gives you access to our Friday calls with the publisher and our online community. The post The Risks of Distant Fatherhood appeared first on The Good Men Project.